This agreement is designed to lease a medical office building facility to a single tenant for its operation as a medical center. The lease is net in character, and grants the tenant five renewal options at fair market rentals for the medical office premises. 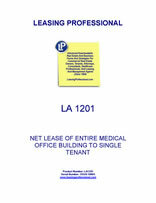 1.1 Lease of Premises; Title and Condition. (iii) all machinery and equipment owned by Landlord and located on, attached, affixed or incorporated into the Land and Improvements including, without limitation, all floor coverings, lighting, appliances, telephone wiring and jacks, and other miscellaneous fixtures and equipment now or hereafter located on the Land and used in the operation of the Improvements (the "Equipment"). Notwithstanding anything to the contrary in the foregoing, the Premises and the Equipment do not include Tenant's personal property, Tenant's tradenames or trademarks or the right to use the same (collectively, the "Tenant's Personal Property"), which shall remain the property of Tenant, or its affiliates, as the case may be. The Premises are leased to Tenant in their present condition without representation or warranty by Landlord and subject to the rights of parties in possession, to the existing state of title and any state of facts which an accurate survey or physical inspection might reveal, to all applicable Legal Requirements (as hereinafter defined) now or hereafter in effect and subject to those matters listed in Exhibit B attached hereto and made a part hereof (the "Permitted Exceptions"). (b) Tenant has examined the Premises and title to the Premises and has found all of the same satisfactory for all purposes. Tenant acknowledges that Tenant is fully familiar with the physical condition of the Premises and that the Landlord makes no representation or warranty, express or implied, with respect to same. The lease of the premises is on an "as is" basis, it being agreed that tenant will lease the premises in their present condition, with all faults. Landlord hereby disclaims any and all express or implied warranties of merchantability or fitness for any particular purpose relative to the premises or any component part thereof. Tenant acknowledges and agrees that no representations or warranties have been made by Landlord, or by any person, firm or agent acting or purporting to act on behalf of Landlord, as to (i) the presence or absence on or in the Premises of any particular materials or substances (including, without limitation, asbestos, hydrocarbons or hazardous or toxic substances), (ii) the condition or repair of the Premises or any portion thereof, (iii) the value, expense of operation or income potential of the Premises, (iv) the accuracy or completeness of any title, survey, structural reports, environmental audits or other information provided to Tenant by any third party contractor relative to the Premises (regardless of whether the same were retained or paid for by Landlord), or (v) any other fact or condition which has or might affect the Premises or the condition, repair, value, expense of operation or income potential thereof. Tenant represents that the officers of Tenant are knowledgeable and experienced in the leasing of properties comparable to the Premises and agrees that Tenant will be relying solely on Tenant's inspections of the Premises in leasing the Premises. The provisions of this paragraph have been negotiated and are intended to be a complete exclusion and negation by the landlord of, and the landlord does hereby disclaim, any and all warranties by the landlord, express or implied, with respect to the premises or any portion thereof, whether arising pursuant to the uniform commercial code or any other law now or hereafter in effect or otherwise, and tenant hereby acknowledges and accepts such exclusion, negation and disclaimer. 1.2 Use. Tenant may use the Premises for any lawful purpose, but may not change the current use if such change would materially increase the risk of violating an Environmental Law. Landlord and its agents and designees may enter upon and examine the Premises at reasonable times, subject to the provisions of Section 9.12. In no event shall the Premises or any portion thereof be used for any purpose which violates any of the provisions of this Lease, including but not limited to, provisions with respect to compliance with Legal Requirements (as defined in Section 2.2(b) hereof) and other recorded covenants, restrictions or agreements which are applicable to the Premises. Tenant shall not use, occupy or permit the Premises to be used or occupied, nor do or permit anything to be done in or on the Premises in a manner which would (i) violate any certificate of occupancy or equivalent certificate affecting the Premises or violate any zoning or other law, ordinance or regulation, (ii) make void or voidable any insurance then in effect with respect to the Premises, (iii) materially and adversely affect in any manner the ability of Tenant to obtain fire and other insurance which Tenant is required to furnish hereunder, (iv) cause any injury or damage to the Improvements which is not repaired in accordance with the provisions of this Lease, (v) violate any provision of an applicable ground lease, or (vi) constitute a public or private nuisance or waste. Tenant shall not conduct its business operation in the Premises unless and until (and only during such time as) all necessary certificates of occupancy, permits, licenses and consents from any or all appropriate governmental authorities have been obtained by Tenant, at Tenant's sole cost and expense, and are in full force and effect. The Premises are leased for a primary term (the "Primary Term") covering the period shown on Exhibit C attached hereto to the right of the words "Primary Term", and, at Tenant's option, for up to five (5) five years consecutive additional terms (the "Extended Terms"), unless and until the term of this Lease shall expire or be terminated pursuant to any provision hereof. The Primary Term and each Extended Term (collectively, the "Term") shall commence and expire on the dates set forth in Exhibit C attached hereto and made a part hereof. "Commencement Date" shall refer to the commencement date of the Primary Term. So long as no Event of Default shall have occurred and be continuing, Tenant may elect to exercise its option to extend the term of this Lease for an Extended Term by giving written notice thereof to Landlord not later than (i) 365 days prior to the expiration of the Primary Term, with respect to the first Extended Term, and (ii) 365 days prior to the expiration of the then current Term, with respect to any other Term. If Landlord and Tenant cannot agree in writing on the Fair Market Rent of the Premises, Tenant's notice of election to extend the term of this Lease for the first Extended Term shall be accompanied by an appraisal of the then Fair Market Rent of the Premises prepared by an Appraiser. "Appraiser" shall mean a member of the Appraisal Institute, in good standing, holding the MAI designation and who is licensed in the State of _____________ (or associated with a nationally recognized firm if permitted under applicable law) and who is familiar with the _____________ market and single-tenant properties with comparable or similar uses. Subject to Tenant's right to rescind its notice to extend the Term as provided in Section 1.4(a) hereof, such notice shall automatically extend the term of this Lease for the Extended Term selected, without further writing; provided, however, either party, upon request of the other, shall execute and acknowledge, in form suitable for recording, an instrument confirming any such extension. Each Extended Term shall be upon the same terms as provided in this Lease for the Primary Term, except as otherwise stated herein. Tenant shall not be entitled to extend the term of this Lease for any Extended Term unless Tenant shall have extended the term of this Lease for the preceding Extended Term, if any. (a) Tenant shall pay to Landlord (or to such other party as Landlord may from time to time specify in writing at least ten days before Tenant makes payment) by federal funds wire transfer in immediately available funds (in U.S. Dollars) (or, if the original Landlord has sold the Premises or there has been a sale of the ownership interest in the original Landlord, by company check) as basic rent for the Premises during the Primary Term the amounts set forth in Exhibit D attached hereto and made a part thereof (the "Basic Rent") on the dates set forth therein (or if any such date falls on a day which is not a Business Day (defined as any day other than a Saturday or Sunday or other day on which the banks in _______________ are authorized or required to be closed), the next succeeding Business Day, the "Payment Dates"), to such account as Landlord from time to time may designate. Tenant shall pay Basic Rent for the Extended Terms, if any, in the same manner as required for the Primary Term, monthly in advance beginning on the 15th day of the first month of the First Extended Term and on the 15th day of each month thereafter for the remainder of the Term. The Basic Rent for each month of the first year of the first Extended Term shall be equal to the greater of (i) 101.5% of the Basic Rent for the last month of the Primary Term and (ii) the Fair Market Rent for the Premises as of the commencement of the first Extended Term. The annual Basic Rent for the second year of the first Extended Term and for each year thereafter for the remainder of the Term shall be increased by 1.5% annually, but 1/12 of such annual Basic Rent shall be payable each month in advance. Within thirty days after the delivery of the Disapproval Notice, Landlord shall submit to Tenant an appraisal of Fair Market Rent of the Premises, prepared by an Appraiser. If the higher of the two appraised values determined by the Appraisers for Landlord and Tenant is less than or equal to 105% of the lower appraised value, then Fair Market Rent shall be set at the average of the two appraised values. If the two appraised values differ by more than five percent, then Landlord's appraiser and Tenant's appraiser shall jointly, within thirty days after delivery of the Disapproval Notice, choose a third Appraiser who shall, within fifteen days after receipt of both Landlord's and Tenant's appraisals, choose one of the two appraised values as the Fair Market Rent. The Fair Market Rent, as determined by the foregoing arbitration procedure, shall be binding upon both Tenant and Landlord. If Fair Market Rent determined in accordance with the procedure set forth in this paragraph exceeds 105% of the Fair Market Rent given by the Tenant's Appraiser, the Tenant shall have the right to rescind its notice to extend the term of this Lease within 15 days after such determination of Fair Market Rent by giving Landlord written notice of such rescission. Whether or not Tenant rescinds its notice to extend the term of this Lease, the fees and expenses of the Appraisers shall be borne by Tenant. (b) All taxes, costs, expenses and amounts which Tenant is required to pay pursuant to this Lease (other than Basic Rent), together with every fine, penalty, interest and cost which may be added for non-payment or late payment thereof, shall constitute additional rent ("Additional Rent"). If Tenant shall fail to pay any such Additional Rent or any other sum due hereunder when the same shall become due, Landlord shall have all rights, powers and remedies with respect thereto as are provided herein or by law in the case of non-payment of any Basic Rent and shall, except as expressly provided herein, have the right to pay the same on behalf of Tenant. Tenant shall pay to Landlord interest, at a rate (the "Default Rate") equal to the lesser of fifteen percent per annum and the maximum rate permitted by law, on all overdue Basic Rent from the due date thereof until paid and on all overdue Additional Rent and all other sums due hereunder, from the end of the third Business Day after delivery of written notice of default to Tenant. In addition, if Tenant fails to make any payment of Basic Rent, Additional Rent or other sums payable hereunder to Landlord within three Business Days after delivery of written notice to Tenant that nay such Basic Rent, Additional Rent, or other sum payable hereunder has not been paid on the due date thereof, Tenant shall pay a late charge equal to four percent (4%) of the amount past due. Tenant shall perform all its obligations under this Lease at its sole cost and expense, and shall pay all Basic Rent, Additional Rent and any other sum due hereunder when due and payable, without offset, notice or demand.